A 1-in-200 year U.S. hurricane loss event could result in insurance and reinsurance losses of as much as $150 billion, which could wipe out as much as 50% of the entire catastrophe bond, alternative capital and ILS market, according to analysts at Deutsche Bank. In an extensive new report Deutsche Bank explores the potential impact a 1-in-200-year U.S. hurricane loss event could have on the global insurance, reinsurance, and insurance-linked securities (ILS) market, estimating that such an event would result in an overall economic loss of between $200 billion and $250 billion. The firm estimates that roughly 55% to 60% of the overall loss would be borne by the insurance, reinsurance and ILS markets, representing between $110 billion and $150 billion, with as much as $80 billion of this total coming from the reinsurance side, both traditional and alternative capital. At the end of 2015 alternative reinsurance capital volume totaled $72 billion and while the underlying risks for collateralized reinsurance, ILWs and sidecars are unclear, for catastrophe bonds (which makes up approximately 30% of the space) roughly 50% of the outstanding market covers U.S. wind risks, representing $12 billion in capacity. Assuming a similar risk distribution for other forms of alternative capital, Deutsche Bank estimates that roughly 50% of all ILS capital covers U.S. wind risks, which represents $36 billion of the market, and which could all be eliminated from the marketplace in the event of a 1-in-200-year U.S. hurricane. The combined loss that would be borne by reinsurers and the ILS market represents 11% to 14% of the entire reinsurance capacity provided, says Deutsche Bank, which translates to a 10% reduction of overall traditional capacity, and the removal of the majority of alternative reinsurance capital that protects U.S. wind risks. 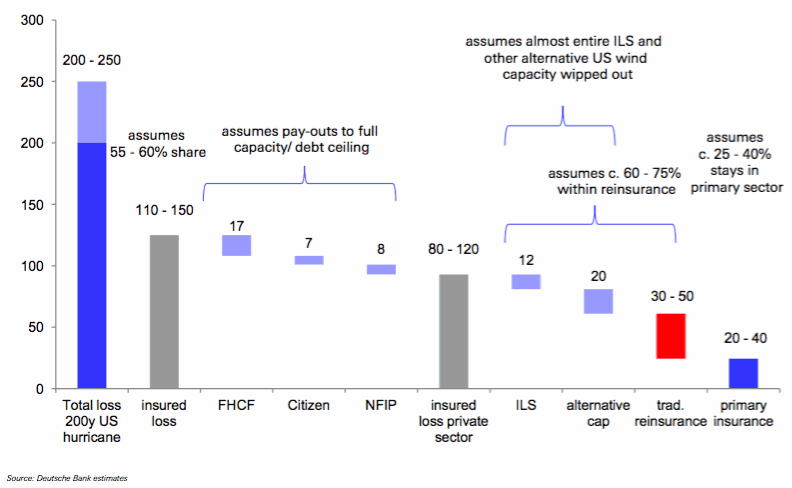 As the above chart highlights, Deutsche Bank estimates that primary insurers would take between $20 billion and $40 billion of the overall loss from a mega hurricane event in the U.S., reinsurance and alternative capital together could see losses of up to $80 billion, with the remaining $30 billion or so falling on public sector entities, the Florida Hurricane Catastrophe Fund (FHCF), Citizens Property Insurance Corporation (CPIC), and the National Flood Insurance Program (NFIP). Deutsche bank stresses that uncertainty surrounds its loss estimates for each individual sector and the marketplace as a whole, as factors such as the location of a land falling hurricane, whether losses are geared more towards flooding or storms, and the impact to commercial structures in relation to residential structures, adds uncertainty. However, the report seeks to provide some insight into the potential burden a 1-in-200-year U.S. hurricane event could have on the insurance, reinsurance, and ILS markets. Clearly a loss of this magnitude would result in a wealth of capacity leaving the sector, but even with overall insured losses of up to $150 billion, Deutsche Bank underlines that a 10% to 15% decline in industry capacity might not be enough to lead to any meaningful price increases. Historically, following a large loss event reinsurance rates increase, but owing to the dynamics of today’s marketplace a mega loss event would likely see price increases of a smaller magnitude than in previous years. The reason for this, explains Deutsche Bank, is that the solvency ratios of reinsurers would remain strong owing to high levels of capitalization, the fact that there’s ample capacity sat on the sidelines from both traditional and alternative sources waiting to enter the space, and that alternative capital remains attracted to the low yield environment. “The low yield environment will likely remain as one driver for new money flowing into this segment. As long as rates stay low, we see no reason why investors should be scared away from this market segment, as it should offer new investment opportunities. We would simply expect a shift, with capital that just got hit from the hurricane loss staying away, while new money flows into the market. “We therefore expect that any price surge following a mega event would be smaller this time, and it remains to be seen whether this would be sufficient to re-coup the losses,” said Deutsche Bank. An event of this size would undoubtedly result in some in the ILS space leaving the sector and looking to deploy capacity elsewhere, but the increased maturity and sophistication of the ILS market and its investor base has contributed to the expectation that there’s an abundance of capacity waiting to enter the space when the next big event occurs. Furthermore, it’s possible that ILS has the ability to recapitalise at a faster rate than traditional players owing to the nature of the business, which raises funds from institutional investors as opposed to issuing debt and so on. The fact that Deutsche Bank has questioned whether an event of this magnitude would result in any meaningful impact on rates in the reinsurance sector underlines just how much excess capacity is in the industry and also on the sidelines, suggesting that any inflow of funds after an event would likely be sufficient to suppress any significant rate increases, as seen in previous years. A hit to the ILS market amounting to 100% of alternative capital that covers U.S. wind risks and 50% of the ILS markets entire capacity would be significant, potentially resulting in some ILS funds going out of business and causing severe difficulties for others. 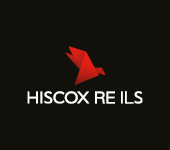 However, the appetite to recapitalise would no doubt have a chance to demonstrate the speed at which investors can now bring new money into the reinsurance market and the larger ILS fund managers would be well-positioned to take advantage of any capacity contraction, across the entire re/insurance market, as institutional inflows would be expected to help them embrace any rate opportunities. It’s important to note that the study from Deutsche Bank doesn’t identify that at least some of the ILS capacity exposed to a U.S wind loss would be on a second-event basis, meaning it could not be wiped out by a single storm. However the data provides an interesting look at what the impact of a major hurricane would be for ILS funds, reinsurance sidecars and their investors.